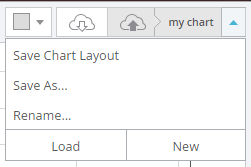 We have added a new panel under your charts. In future it will contain multiple features. We have moved the Pine Script Editor onto the panel to begin with. The panel is opened once you click on “Source Code” button of a script. If the script is from common library, the tab and the code itself will be marked as locked. In this case you need to click “Make a Copy” first. As soon as the script is yours, you can rename it, apply to a chart or publish it. The “Favourite” (star) button next to the script name allows you to add it to the corresponding panel. You can change size of the panel by moving its border with your mouse. Click on the header of the panel to hide/show it. If there is a compilation error, the panel is opened automatically. We have moved the “Save” and “Load” buttons to the top right corner because of the new panel.